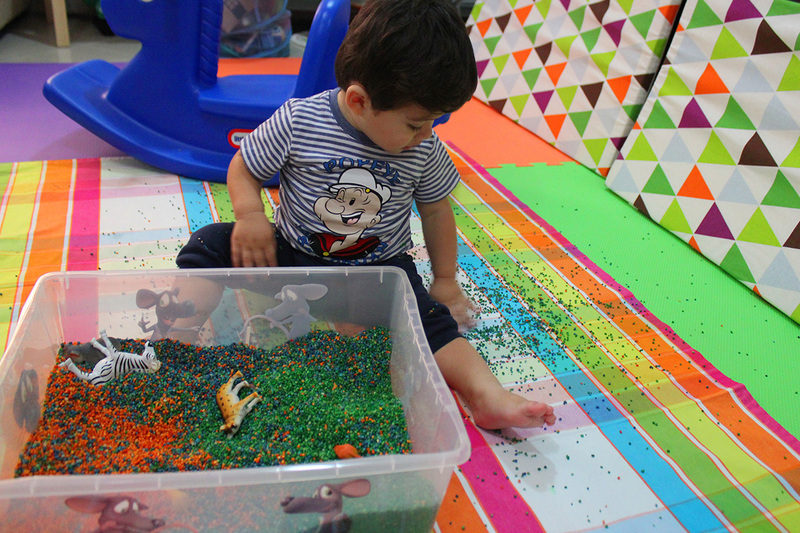 Homemade sand for hot days (or rainy, but it’s not the case in doha), when it’s not convenient to play outdoor. Very easy and low-budget activity. All you need is cracked wheat and colors ( i always recommend wilton icing gel). One kilo bag of cracked wheat needs one tsp of the coloring gel. Mix well until the color is even and let it dry. 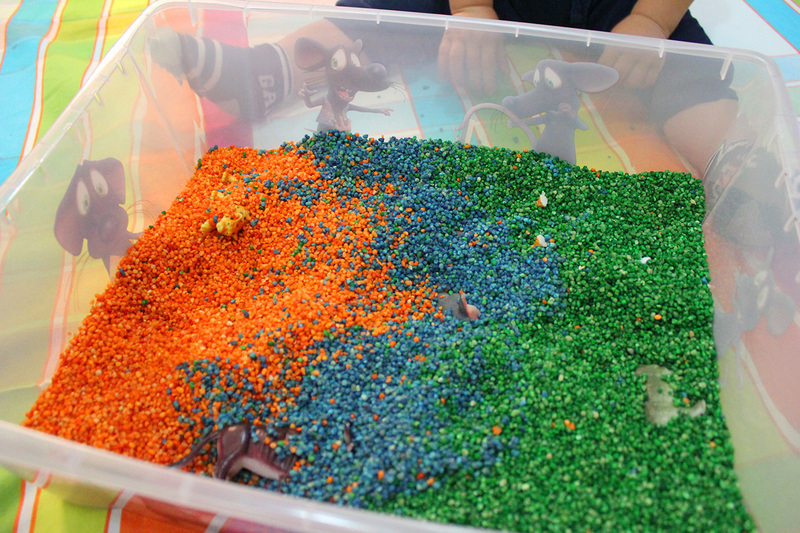 To kick off the fun, I put them in a container and hide the small animals for Nady to dig in. 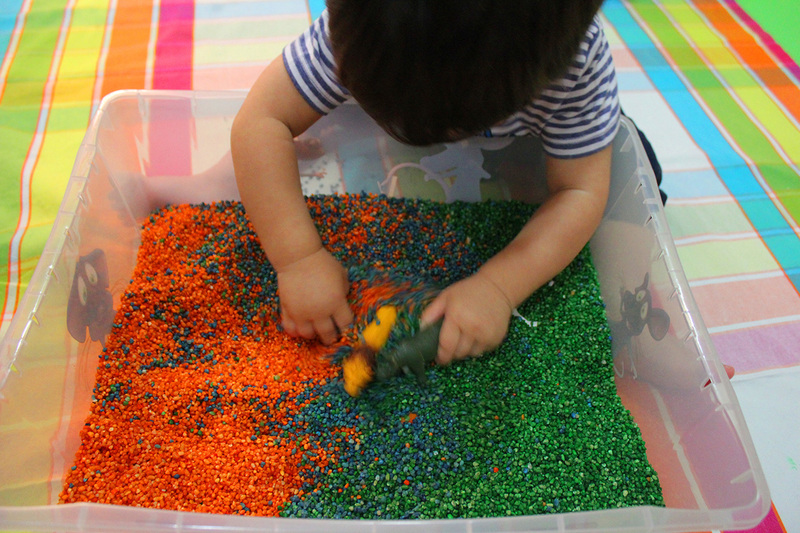 Children have always been intrigued by sand play. They dig in, pour it, enjoy the feeling, pretend with it and explore how it moves. 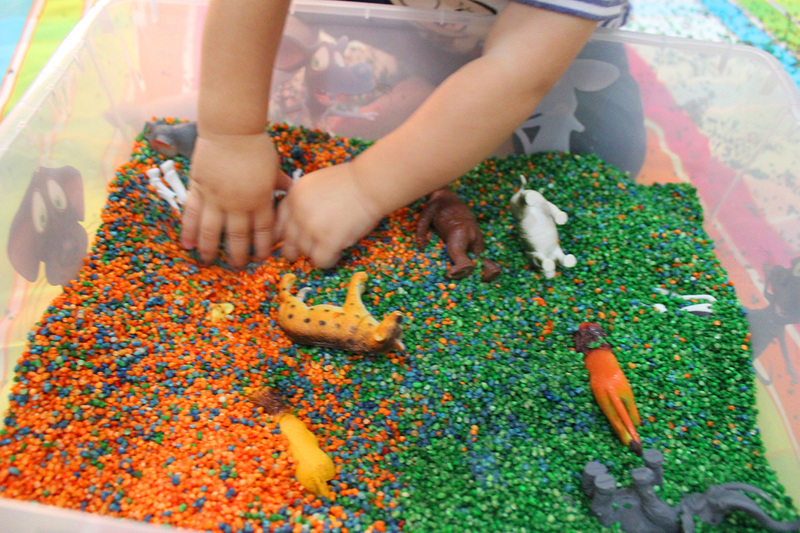 Sand play is open-ended, there is no right way to play with, it stretches the imagination of the kid, provides a soothing sensory experience and it’s an excellent avenue for children to learn physical, cognitive and social skills. Children are not born with a know how to play, parents should teach them! that’s why at the beginning children just observe before starting to explore. What does this feel like when I touch it? What does this sound like when I squeeze it? What will happen if I push this or pull that? Crawl over there? Pull myself up on this? Get down on the floor with your child. 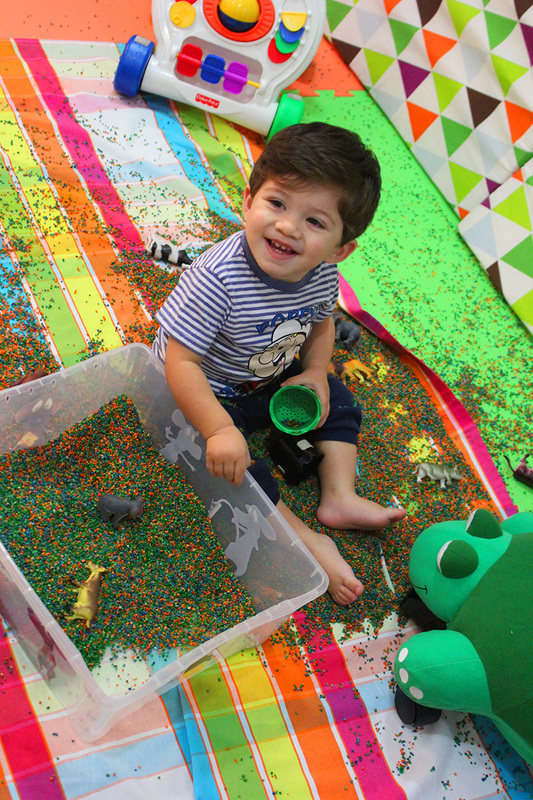 You are the ultimate plaything, and any activity will seem more fun if your child can share it with you. Talk to him while you play and you’ll help boost his language skills. Let your child choose how to play, you can suggest new things or present new options, but he should be the boss. 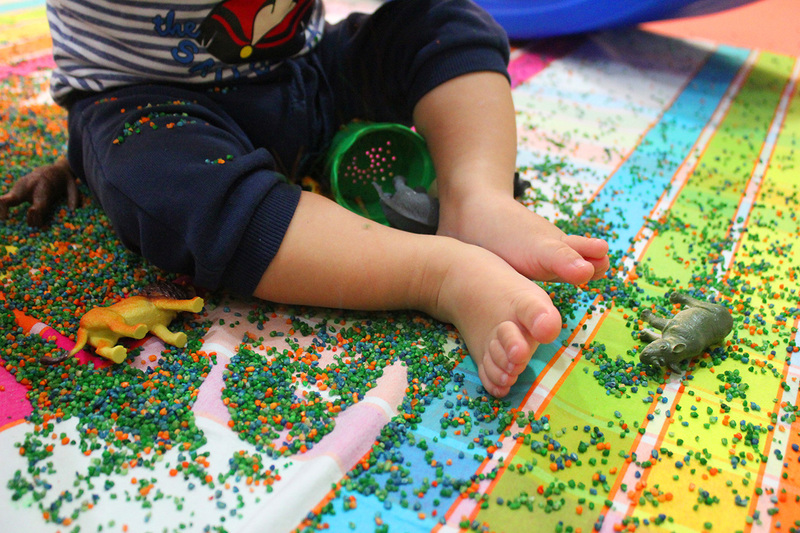 Physical development: Children will be given the tools to develop and practice fine motor skills and eye hand coordination, such as pouring and spooning and will provide opportunities for children to compare textures such as smooth, rough, hard and soft. 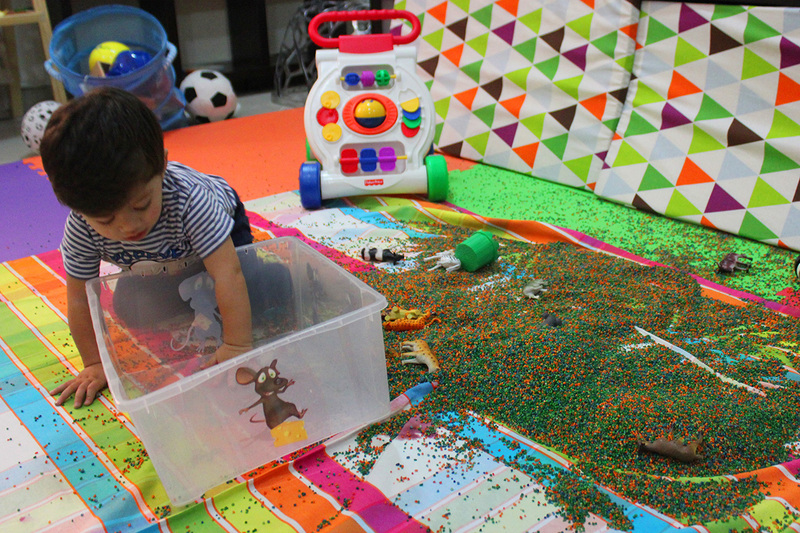 Communication and language development: During messy play, children will be given many opportunities to speak and listen. 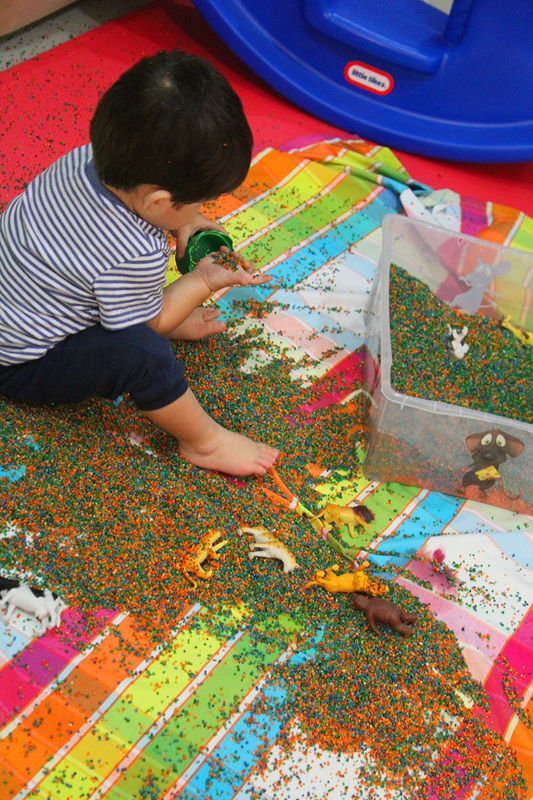 Personal, emotional and social development: Messy Play is designed with children’s natural curiosity in mind. 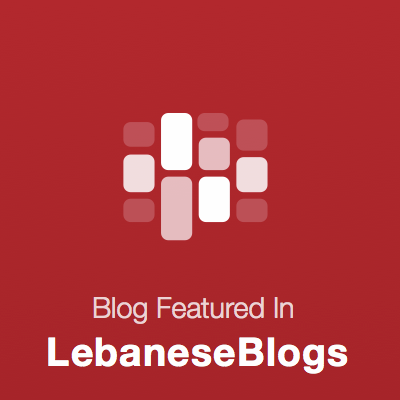 It encourages a positive approach to new experiences. 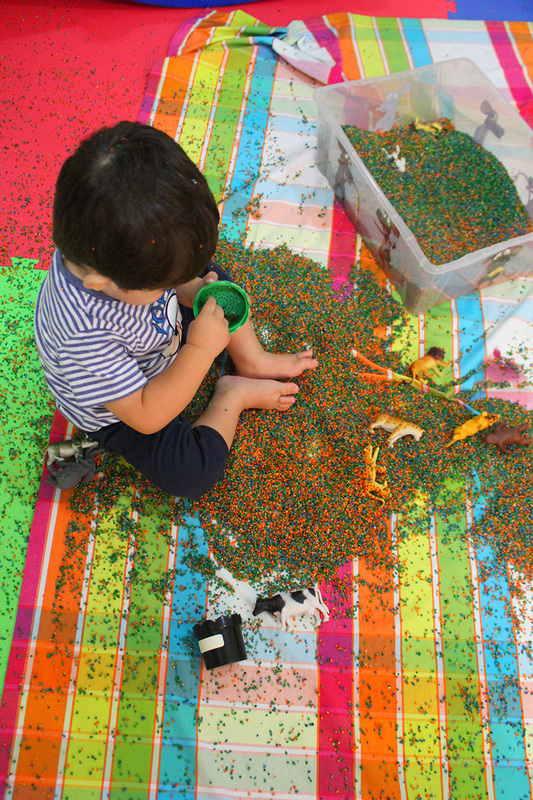 There is no “right” way for children to do messy play. This builds self-confidence and self-esteem. They develop concentration, problem-solving and planning. Intellectual development: Children will investigate, explore, design and create leading to a better understanding of the world around them. They will learn to group and classify, arrange items in a logical order, identify and match and understand cause and effect. 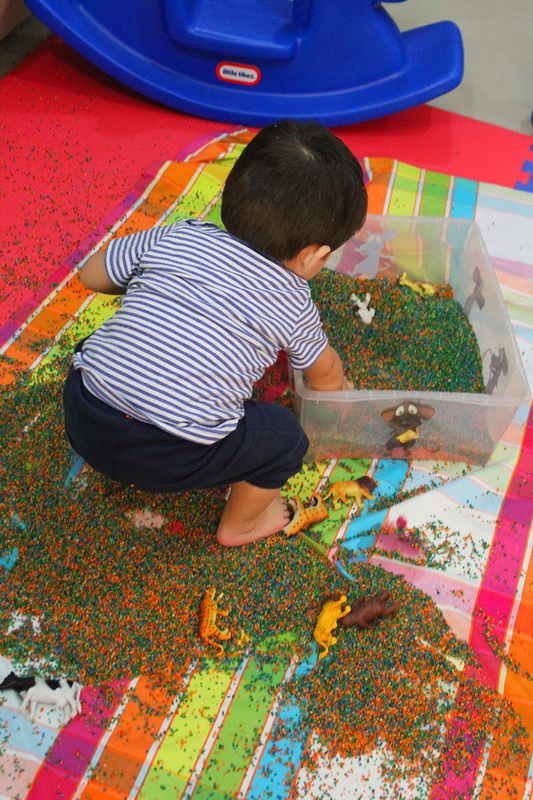 Mathematical development: The children will sort objects, fill containers and create patterns. 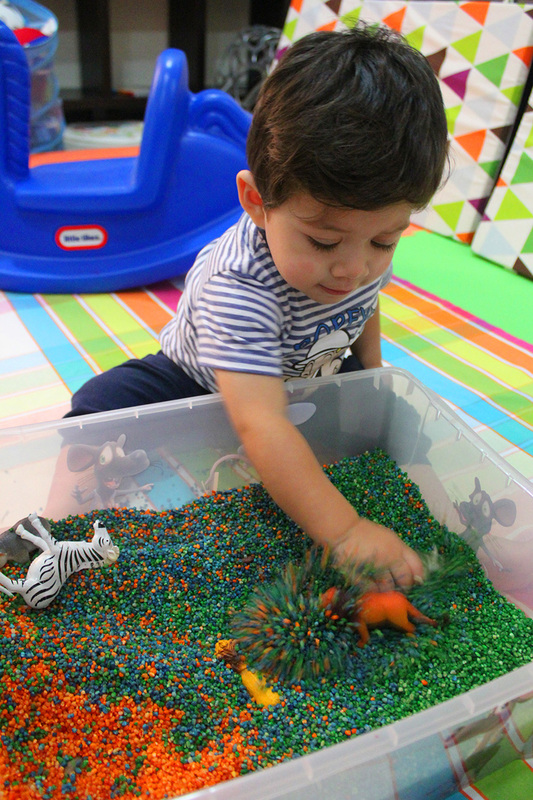 Creative development: Children are given endless opportunities with a variety of materials to build imagination and creativity. Through sensory experiences, they are able to respond to what they see, hear, feel, touch and smell. 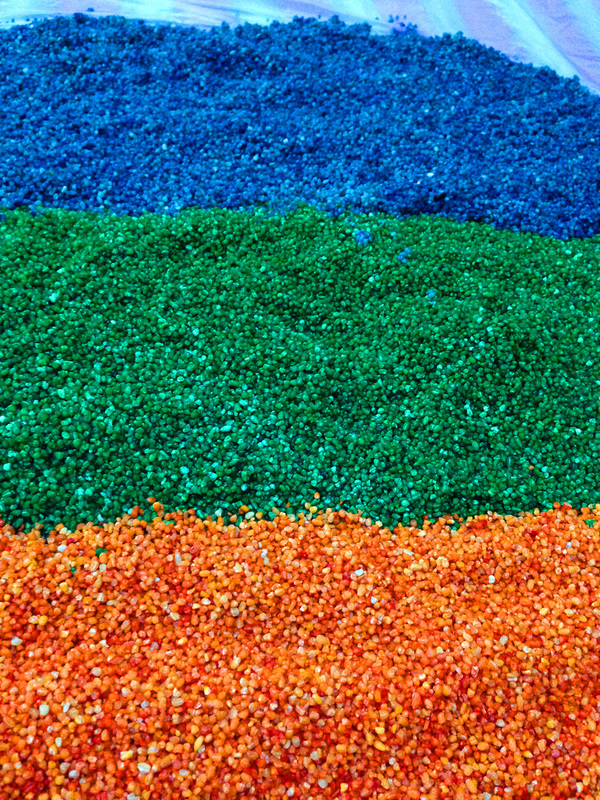 They will express their feelings and thoughts through color, texture, shapes and forms in two and three dimensions. 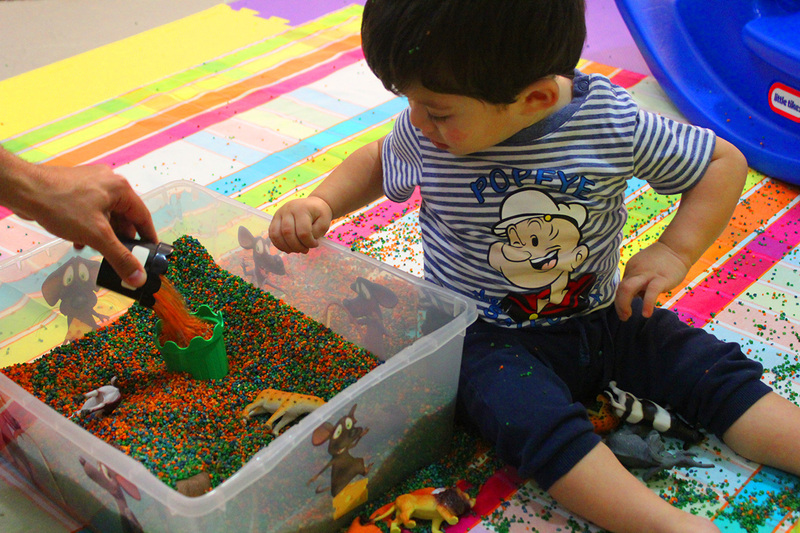 It was a successful fun activity, Nady was extremely happy and enjoying every second! we played for 90 minutes non stop without loosing interest or getting fussy. 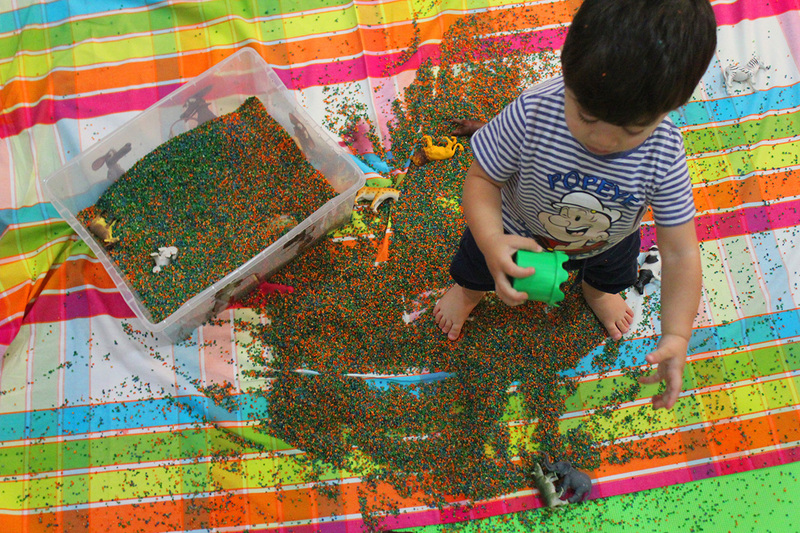 This entry was posted in DIY, way to play and tagged blog, colored sand, colors, cracked wheat sand, DIY, fine motor skills, homemade snad, how to make sand at home, jaymmy, marmite et ponpon, motor skills, sensory play, way to play. Bookmark the permalink.